This is a short introduction to the 5 largest German citiesys, with a map indicating where they are and general population numbers. The numbers are taken from the Federal Statistical Office (Destatis), based on the 2011 census. This is an official and reliable source of information for population statistics. Berlin is number one of the largest German cities and significantly larger than any of the other towns. Berlin has been the capital of Germany since the reunification of West and East and the fall of the Iron Curtain in 1990. The parliament (Bundestag), official residence of the president (Schloss Bellevue) and many other important political institutions are located here. Hamburg is located in the North of Germany on the Elbe River, close to the North Sea, but not on the coast itself. Hamburg is an important sea port, second largest in Europe, and a lot of imports and exports from or to central Europe pass through the city. The city has become an important cultural and media hub. Many TV stations, newspapers, large magazines and internet companies have their headquarters in the city. Munich is the third of the largest German cities and capital of Bavaria, the largest German state by area. Many of the images typically associated with Germany internationally, like Lederhosen, Schweinshaxe (pork knuckle) and Oktoberfest are Bavarian icons. In terms of these stereotypes, Munich is maybe the most “German” city (and mean that totally unbiased). 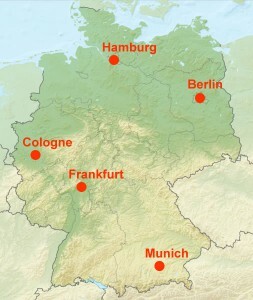 Munich, however, also has a strong economy and is home to global companies such as Siemens and BMW. Cologne is fourth in the largest German cities and also one of the oldest cities. It was founded around 50 AD by the Roman Empire as a major military castle. Cologne is situated on the Rhine River and held important strategic importance in expanding the empire across the river into the territory of the Germanic tribes. In the Middle Ages Cologne became an important city of the Roman Catholic Church. This was also the time when construction of the famous Cologne Cathedral (which contains the relics of the Three Wise Men) began. Today the city is well-known for its carnival and arts scene. If you would like to know more, please also read my article “Five things you should do when in Cologne”. Frankfurt is Germany’s financial center and an important global financial center. Frankfurt is home to the European Central Bank, the Frankfurt Stock Exchange and the German Federal Bank. Many other banks, such as Deutsche Bank and Commerzbank, are situated here as well. In addition to its financial sector, Frankfurt is an important transportation hub: Frankfurt Airport is home to Lufthansa and one of the busiest international airports worldwide. If you are interested in the population numbers of other German cities, please have look at this pdf document of the Largest German Cities (PDF) . It lists all towns with a population of more than 100,000. Ist jetzt korrigiert, danke für den Hinweis Andrea.